ESEN ELEKTRONIK SANAYI VE TIC.LTD.STI. Norwegian - S’enfuir. Récit d’un otage. A century after Nietzsche’s death, we have yet to fully examine the revolutionary implications of his philosophy. In fact, various kinds of interference stand between Nietzsche and ourselves : a sister who misrepresented his legacy, two wars and several ideologies that brandished Nietzsche’s name in the service of causes he would certainly have repudiated, and, most problematically, a long line of readers and interpreters who have approached his work in bad faith. All this has gone toward creating a false, distorted, and even dangerous image of Nietzsche — an image in urgent need of correction.A philosophical biography is not a substitute for reading the philosopher’s own work, but it does offer a unique perspective on the origins and meaning of his thought. It shows us that a thought does not tumble from the sky like a falling star — cold and dead — but rather emerges from the earth, like an arc of glowing lava. More specifically, it is born of a living body: a flesh and heart that are incarnated within a specific life, a milieu, an era. This incandescence presupposes a personal history, a context, a world, which includes parents, a family, encounters, sufferings and joys, desires and pleasures, passions, sorrows and ambitions — in short, all the things that customarily define a living being within his or her life.Putting a philosopher’s life into images can help us toward two things: first, reading the work itself, that is, meditation, reflection, consideration of the text; second, and later, bringing this reflection to bear on oneself, as the reader imagines the construction of the self from a philosophical perspective.Friedrich Nietzsche offered us new ways of being: true enough. But we cannot simply adopt his ideas wholesale — that would be, and seem, ludicrous. Instead, we must carefully study how to adapt them to create a philosophical practice that works for us, that fits our unique specifications.Here, we offer a portrait, or a sketch toward a portrait. A few strokes of the pencil to evoke an energy. 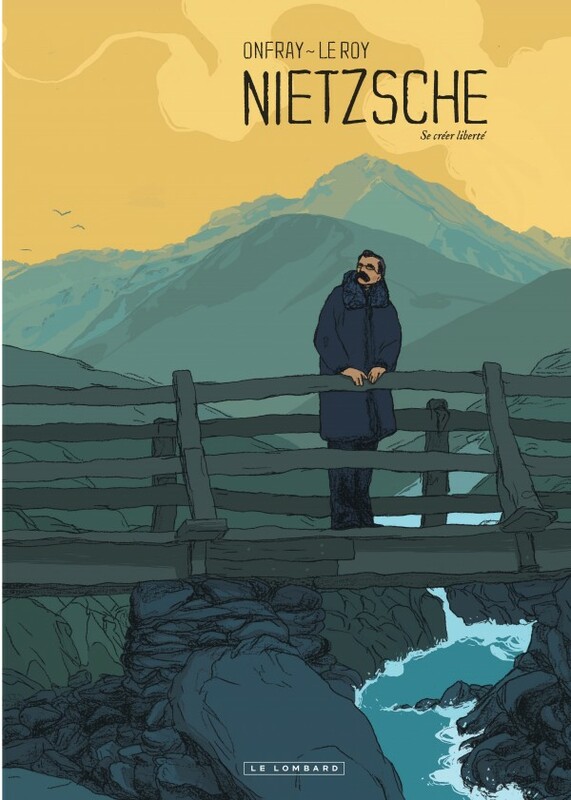 This is Nietzsche as poet, as a thinker who maintains the ideal and necessary distance between ideas and metaphors, between concepts and images: a river, a volcano, a thinking, writing storm. 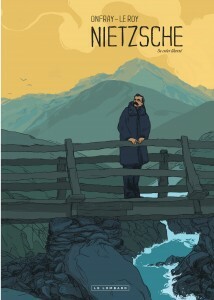 Nietzsche as traveller, as loner, as free-thinker, fleeing the herd mentality and the moralizing of institutions, shunning religious dogmas and their false paradises… Nietzsche as ‘dynamite,’ as, indeed, he described himself.This story, in two volumes of 62 color pages each, is written by the philosopher Michel Onfray (author of almost 50 works, notably the ‘ Traité d’athéologie’ (‘Treatise on Atheologism’)), and is drawn by Maximilien Le Roy (published as Cmax by XXI, Futuropolis, Paquet, and La boîte à bulles). Michel Onfray is the author of numerous books on Nietzsche (L’innocence du devenir (The Innocence of Becoming), La sagesse tragique (Tragic Wisdom), etc.) For his part, to better reconstruct the places referred to in the album, Maximilien Le Roy traveled through Europe in the footsteps of the philosopher (through Germany, Italy, and Switzerland).The authors are also in the planning stages of developing a whole collection of BD versions of the lives of the philosophers, all of which illustrate the Nietzschean phrase: ‘To create oneself freedom.’.